The design of an axe goes back hundreds of thousands of years back to the days where they were made out of twigs and rocks. Since that time, the materials have advanced but the basic design remains the same: a single cutting head on top of a long handle. Despite the simplicity of the design, a good axe is an invaluable tool with a lot of different uses depending on the situation. The most important thing to an axe is the cutting head. Different axes feature different head styles depending on the intended use: some are flat or broad, wedged, curved, etc. If you need an axe for something specific like chopping or splitting, it is best to find an axe designed for that purpose. Otherwise, multi use axes often come with general head shapes and a long, gripped handle for extra comfort. To help you determine what kind of axe is best for you, here, the top axes options to choose from. A good axe is more than just a simple cutting tool. It offers a certain type of utility that is important in many professions that work outdoors or with materials like wood. In some cases, it can even help save a life. That is why the best axe is one that is versatile enough for different uses while getting the most important thing right: it is easy to use and maintain. 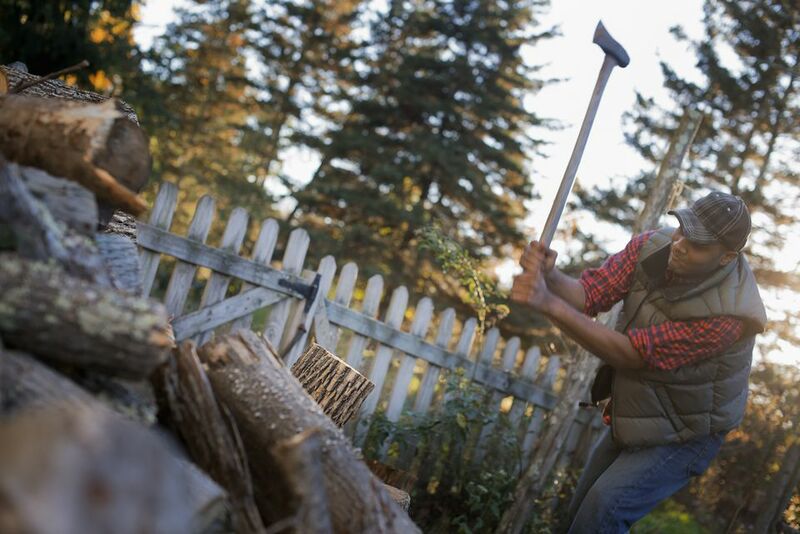 The Fiskars X15 Axe is the tool to choose when you need something that maximizes the cutting force with each swing. The axe features a smart design that perfectly balances the cutting head in your hand. A FiberComp handle keeps the energy contained at the cutting point instead of traveling into your hands and arms. As a result, chopping strokes are more efficient thanks to the greater energy transfer and sharp blade. A budget axe is a great option to buy if you are looking for something small to use around the home or during your next camping trip. Most more affordable options tend to have a traditional design and look. Skipping out on the advanced carbon fiber handles and lightweight metals, budget options stick with the tried-and-true steel and wood combination for extra cost savings. The Cold Steel Trail Hawk is a traditional axe that is small enough to keep with you during outdoor adventures and camping trips. The two-inch blade is made of drop forged carbon steel, offering plenty of durability of repeated use before it begins to dull. An American Hickory handle is shaped to provide a comfortable grip and efficient swing while in use. The image many people conjure when thinking of a traditional axe is log splitting. Standing outside, swinging an axe head at a log, is a lot easier than it looks if you do not have the right tool and technique. While the technique may take some time to develop, the right tool is easy to find. Log splitting axes tend to be lightweight and come with a wedged cutting head that cuts and splits with a single stroke. To split logs in remote locations or at home, the Estwing Camper's Log Splitting Axe is specifically designed to give you a clean and efficient split with every stroke. Unlike other splitting axes, this one is an all-steel construction with a molded grip for better comfort. It is strong, lightweight, and absorbs shocks so you can comfortably hold and use the axe for a long time without fail. Out in the wild, survival can be a matter of having the right tool for the job. Even weekend camping trips require the proper tools to get by. This includes a small, trusty axe you can use for cutting up firewood, clearing trails, or even defending yourself against wild animals if you do not have any other options. This makes the right camping axe all the more important for a good time in the woods. While camping, it is important to have a tool you can trust. The IUNIO Camping Axe sports a simple steel axe head with a unique, multipurpose handle that hides a number of other survival tools such as a compass, knife, hammer, and fire starter. Each item stays in a separate compartment of the handle so you can easily find and use the necessary tool anytime you need without searching for it. A double bit axe is a unique option in the world of axes for one very simple reason: you get two for the price of one. With two blades instead of the traditional single setup, you get an extra cutting surface to use. Typically, however, the extra cutting edge comes blunt for hacking, hammering, and other activities that do not require a sharp edge. Sporting dual cutting heads and a perfect balance for extra control, the Estwing Double Bit Axe may look like something out of medieval times. In reality, however, the design of this axe makes it a great multipurpose tool including cutting, splitting and clearing wood. The double blade design increases longevity and durability while giving you more control over the swing and stroke. It is difficult to imagine an axe being anything else than just a simple cutting tool. When designed well, however, an axe can be a great survival tool that does more than more cutting and splitting. A survival axe combines a lot of different tools into a single body you can carry or transport with you anytime you are on the road, out in the wild, or somewhere else where help is scarce and far away. The Trucker's Friend All Purpose Survival Tool may not look like a traditional axe at first. Designed for use on the road, this survival tool combines a few different tools into one head. In addition to the curved cutting blade, you will get a hammer, nail puller, pry bar, and spanner you can use during emergency situations or in bad weather. The axe sports a fiberglass handle to remain lightweight and easy to carry. At a time, a throwing axe was a prime hunting tool used out in the wild. These days, throwing axes like the traditional tomahawk are used more for sport than anything else. Regardless, the requirements for a good throwing axe remain the same: lightweight, aerodynamic, and consistent reliability in terms of aiming. If a throwing axe lacks any of these, it will not be a good tool to have. The Estwing Tomahawk Axe is designed for long range and a high level of accuracy. The aerodynamically shaped body uses a one-piece design for maximum durability while remaining lightweight for better distance. Best of all, you can still use the tomahawk as a regular axe, cutting and slicing through many different things while outdoors or at home.